ISBoxer.com • View topic - Help to disable 'backtick' key.. left from number 1. Help to disable 'backtick' key.. left from number 1. Please help me to disable the 'backtick' key, the shift-~ key (or the left of the number 1). I need to be able to type it out as a normal character whilst playing EQ.. and it automatically takes me and toggles thru the sessions instead. Re: Help to disable 'backtick' key.. left from number 1. 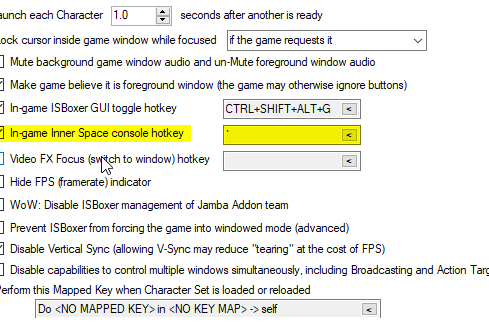 This is an InnerSpace sessions hotkey which is normally disabled when using ISBoxer. If it is not disabled when using ISBoxer, then it is usually set on the Character Set as the "In-game Inner Space console hotkey". If this is not ticked, then you have something else loading in InnerSpace that is re-enabling it, or you are not loading your team via ISBoxer. Using either the ISBoxer GUI and clicking launch on 'charater set' or individual slot, this happens (as well as using the red inner icon in taskbar, and doing the same).. sorry, not sure if there's a difference. In the char set, the option for 'In-game inner space console hotkey' is de-selected (not ticked). I've just tested this, and launching a character set using the InnerSpace icon in the tray, selecting ISBoxer Character Sets, and then the charcter set name, which is the recommended method to launch a team. I cannot get the InnerSpace sessions console to appear using the ` key, unless I have this option selected.